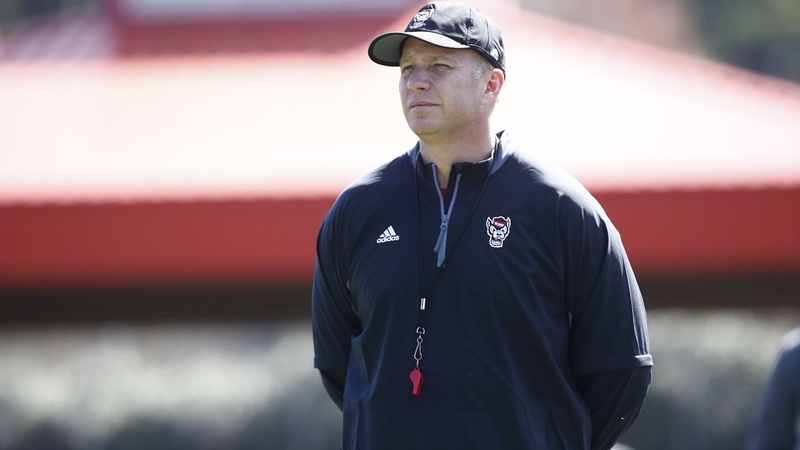 NC State head coach Dave Doeren met with the media today following spring practice. Their mindset and the way they work everyday is probably the most impressive thing. All of them have ability. They’re very consistent. They make mistakes, which you expect, and you see them learn from the mistakes and correct things. So that’s kind of where we’re at. We’re just trying to put these guys in a bunch of situational things and see how they handle it. Do they panic, if they have a bad play do they bounce back quick, and how [do] they lead the group? I think Matt, obviously being in the role he was in last year having played in games and knowing the offense, his comfort level is just different because of the experience factor that he has. Devin does some things with his arm that nobody can do. Bailey’s learning. You see signs where he’s got it, and there’s signs where he doesn’t. It’s going to be a big summer for all three. It’s possible. I’ve had to do it. It’s not ideal, but if it helps you win, then that’s what you do so we kind of see where we’re at. It’s been fun getting to know these guys. The first thing is just you can tell that they’re excited to be here. They’ve blended right in. Once the families of the coaches get here, you can tell it helps them. They’re all here now, and the guys have bought homes and moved their families. That’s such a pain. It’s hard being away from your wife when your wife has to take care of three or four kids without you. That’s stressful, so it’s good to get them all together. They’ve brought some new things, and we’re getting to experiment with some ideas. It’s been a good growth, and just hearing them talk in our staff meetings, even bringing up ideas, gives you new ways to look at things and different lenses. Hopefully we’ll have enough offensive linemen to have a spring game. That’s still up in the air. Right now, assuming we can have it, we want to see the guys compete. We want to see the finish of plays, contact catches that we’re not having in practice, and at the quarterback position we want to see who can sustain drives, who can score touchdowns, who can win on third down, and who can not make mistakes and hurt our football team. There’s not going to be a lot of special teams just because we’ve changed a lot of schemes that we don’t want to put on TV. There won’t be a lot of blitzing or any of that. I think you’ll see a pretty vanilla game plan so that both sides can play technique. What’s the weather supposed to be? Does the lack of offensive linemen change the format? It could. If we don’t have enough, then we won’t have them out there. We’re going to get everything we can get out of it, but we’ve got to take care of the guys, too. What are some of the position battles you’re excited about going into the summer? We were hoping for a battle at the corner position, but Teshaun and Taiyon have not been able to practice with hamstrings, so we didn’t get to see that competition. So that’ll be one that carries forward into fall camp. Nick McCloud hasn’t been able to practice. Chris Ingram has gotten a lot better. I’m really excited about his growth at that spot. Kishawn Miller’s probably one of the most improved players on our team right now. Coming off an ACL a year and a half ago takes time mentally to overcome that. The running back position, once we get Jordan Houston in here and getting to see him and how he competes and getting Ricky back to have three healthy guys there that we think can go, will be a position that we want to watch. Do you have to give the QBs a “You be you” speech given what you’ve had here at quarterback? I don’t know if Kurt does that. I haven’t felt like they’re pressing and trying to be somebody they’re not. If I felt that way, then I would. Right now, I think they’re just trying to catch the snap, get through the play, and do what they’re supposed to do. Concerning we have so many injuries. With so many new faces it seems important to have everyone working on schemes and fundamentals. Hopefully we can get guys healthy. The artist formerly known as LuvtheHerb - DONT PANIC!